Kurds are a culturally unique people with strong tribal organization, who live throughout the Middle East. Under the Sultan Saladin, a Kurd himself, the Kurdish people flourished and established themselves throughout the Kingdom. Their skill at arms would mean they would be called upon for war, and some have embraced the opportunity. 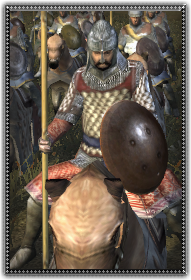 Kurdish lancers are fortunately armored and are useful to punch through infantry, and are among the heaviest cavalry in the Sultan’s arsonel.